Hi guys, I am just getting started a 8 Bio. My clean up crew are in and I can't wait to get some cool looking corals. I'll try to get some pictures going on a bit later, but I got to get myself a good camera. I always enjoy good advices. Congrats on the new tank and Welcome to AquariaCanada! Just remember to be patient and not to rush the tank. 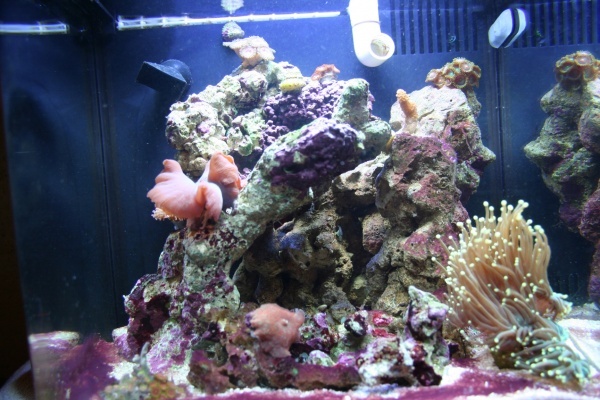 Yes, I know, I am eager to get stuff but one of the main things with this hobby is to be patient, so I am dreaming and also getting a list of all the corals I want to get, so when the time comes I will be ready! WElcome to the site Joker216609... I've always wanted a cube of my own... but ended up getting a wall aquarium instead. Looking forward to some pics!! Allright! I finally bought a nice camera to show my tank a bit!! I have to give a special thanks to Redbelly who has provided me with most of my corals!! The torch is the best one! Tell me what you think! Other pictures comming up soon. Oh and I know I have a small cyano problem, I am trying to fix it with alot of flow and less lighting! tank lookin good, i like the rocks. could just be a normal part of a one month old tank. personally i think you may be going a bit to fast, there are a few delicate species in there. It does look good but I'd say it might be a little fast as well. I wouldn't add anything for a while now. 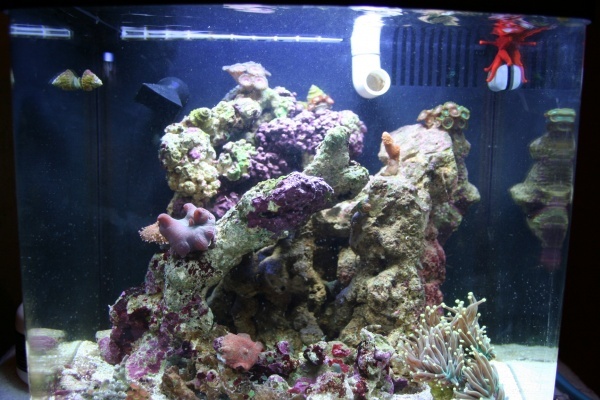 If your tank has not cycled fully yet the first 3 inhabitants on your list may not make it. Sit back enjoy your tank and give it time to stabilize. Ya don't worry guys the fishes won't come in for a while. I will try just to get my existing coral to grow a bit more a wait(which is the secret in this domaine) and then I will maybe start with the yellow clown goby!! But just for the record my tank is about three months old. I know it os still young and wil be careful. I am doing my water changes every week, about 3.5 gallons each times. Maybe what is going next in my tank will be some sorts of Zoos but for the rest I will wait and enjoy the view of my current specimens!! Thank you all for the comments and if you have other advices you are always welcome to make them! !